On my way through the galleries last week, I was stopped by a painting at the top of the stairs leading to the Music Room. There, hanging unassumingly on a wall all to itself, is George Rouault’s Church Interior. What caught me was the strange texture and shape of this otherwise fairly standard painting—the work seems to bubble out from its frame like an expanding balloon. Before looking at the label, I toyed with and quickly discarded a list of possible materials: Glass? No, too thick. Wood? Too smooth a curve. Plastic? Too undulating a surface. Finishing my game, I gave in and looked to the placard for the answer: enamel on copper! I racked my brain for other examples of works on copper, but couldn’t come up with any. Naturally, my next step was a search of the Phillips’s collection for similar works and then, finding none, of the world at large. It turns out that copper had something of a heyday in the 16th and 17th centuries as an artistic canvas, of interest to El Greco, Rembrandt, and a slew of others. This entry was posted in Experiment Station and tagged artist materials, artist methods, copper, metal, metal in art, unique artist materials. Bookmark the permalink. I love the way Rouault pushes the sheen even further with enamel. So tactile. Seems to convey a bit of a puffy paint personality. I’ll have to come look closely in person. I am very grateful that you posted your personal experience with the enamel-on-copper painting by Georges Rouault. Being able to view this work has been extremely helpful in my research. But I need to draw your attention to a couple of basic facts concerning the Rouault enamel. And please, I ask that you share my information with your colleagues at The Phillips Collection because they are most likely unaware of this work’s origins. For starters, in your blog entry you provide a link to an article titled “Reflections of the Past: The Resurgence of the Copper Canvas” in which the author Donna Dvorak offers a very brief synopsis of why Renaissance era artists used copper as a material on which to complete their oil paintings. The remainder of the article features two currently working artists who use copper as the canvas to their oil paintings. And Rouault did not create this work by himself. It was a collaboration with Benedictine monks who had the knowledge, materials, and facilities to create vitreous enamels-on-copper. In 1945 an enameling workshop was started at the Saint Martin’s Abbey in Ligugé, France, to work on models by Georges Rouault , Georges Braque, Alfred Manessier, Marc Chagall, Edouard Goerg, André Marchand, Jacques Villon, and Léon Zack at the initiative of Father Jean Coquet, who was a friend to these artists. Thanks to him the workshop reached international fame, with exhibitions and awards in Tokyo, Milan, New York, and Karlsruhe. Here is the link to the website for the Saint Martin’s Abbey in Ligugé. Although the text is in French, go to “Historique: L’histoire de l’abbaye de 361 après JC à nos jours” and scroll down to the date of 1945. There you will see that it describes the establishment of the enamel workshop and the list of artists with whom the Benedictine monks worked. 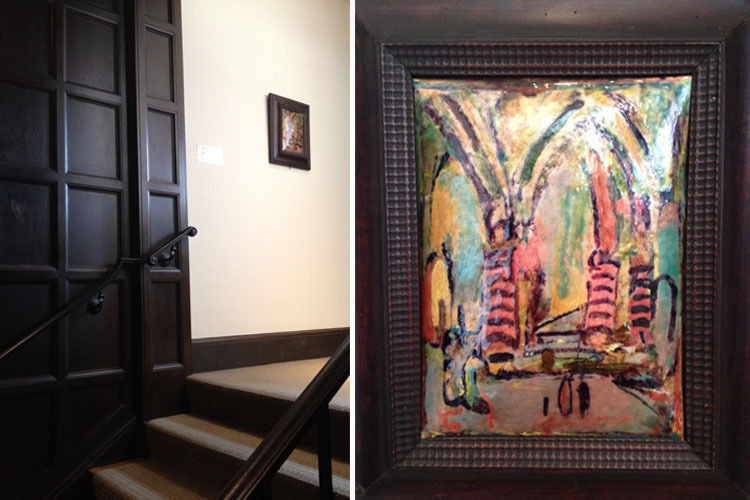 Bottom line, Rouault’s “Church Interior” from 1952 that you have in The Phillips Collection is a glass object that is married to copper. As such, it is a work of art that is part of the rich and varied history of fused glass on metal. And because it is a work of the twentieth century and more specifically a result of the post World World II ‘Studio Enamel Movement’ that took place in Europe and the United States (concurrent to the Studio Pottery Movement), Rouault’s enamel-on-copper has a greater artistic affinity to enamel works such as Edward Winter’s “Peace and War” from 1938 (collection Western Reserve Historical Society, Cleveland), Ruth Raemisch’s “The Lovers” from 1948 (collection Providence Art Club, Rhode Island), and even Harold Helwig’s “Angelic Devils” from 1968 (collection Museum of Arts & Design, New York). Should you and your colleagues at The Phillips Collection like to learn more about this important artistic medium, I strongly recommend the book “Painting with Fire: Masters of Enameling in America, 1930-1980” by Bernard Jazzar and Harold Nelson (2006, Long Beach Museum of Art of Long Beach, California). I also recommend that you contact the authors through their website for The Enamel Arts Foundation in Los Angeles with any questions.